Some people think that a hard drive with hundreds of free gigabytes needs little in the way of management. There's no need, they say - you're not going to run out of space for a very long time. While they have a point, the reality is that hard drive clutter has a very real effect on your PC, no matter how much space you've got free. The more files you have, the longer it takes to search your hard drive, to defragment it, and to scan for viruses, for instance. 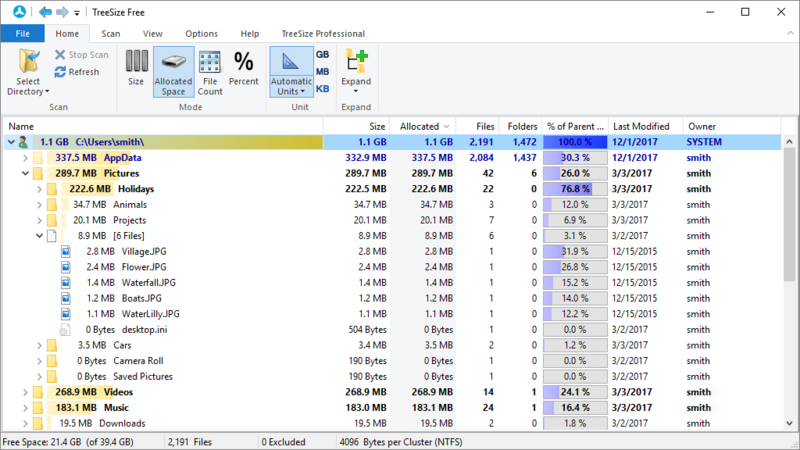 Even navigating around in Explorer takes longer as the program has more work to do. It pays to keep a careful eye on where your hard drive space has gone, then, and TreeSize Free is just the tool to help. Right-click a folder in Explorer, click TreeSize Free, and the program will open and display a list of all your subfolders, sorted according to how much drive space they're consuming. Trying this out on a test PC revealed that our Program Files folder has swallowed up some 30GB. So who's using that? You can zoom in on any folder by expanding it, just as in Explorer, and then TreeSize Free displays the space used by all the subfolders. Showing that, in this case, the biggest space hog was the Steam folder created by a Call of Duty: Modern Warfare 2 installation, which had gobbled up more than 11GB of hard drive real estate. If you're still using the largest applications on your system, then no problem - they can stay. Scan down the list, though, and you may find TreeSize Free has highlighted space-hogging programs, or folders you'd created long ago and forgotten about. In which case you can remove them, recover some space, and many PC operations will now be just that little bit faster. - TreeSize Free now supports exporting the result data of a scan to a PDF file. - TreeSize Free can now show customized folder icons optionally. - A new option to highlight large elements has been added. By default, TreeSize Free shows files and folders in bold that make up at least 15% of the overall scan. - TreeSize Free is now also available with Czech and Swedish translation. - Bugfix: Using Shift + Delete will now delete the files permanently again instead of moving them to the recycle bin. - Bugfix: The shortcut Ctrl + X to cut the selected files to the clipboard now works again as expected. - Bugfix: Aborting a deletion process no longer removes the affected elements from the view. - Bugfix: The position and size of the Treemap chart is now persisted and restored correctly on the next start of TreeSize Free. - Bugfix: The label assigned to a drive is now shown again. - A few minor fixes and improvements have been incorporated. This is exactly what I was needing. I had used other tools that would just scan the surface. However, this tool went beyond the surface and dug really deep. Now I can see where a lot of my disk space is getting used. Whereas before, I couldn't understand where all this space was getting used. Thanks PC Authority.